246 pages | 2 B/W Illus. 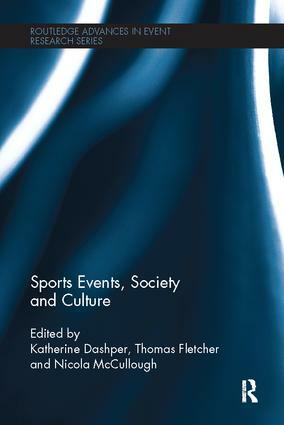 This innovative and timely volume moves beyond existing operational and pragmatic approaches to events studies by exploring sports events as social, cultural, political and mediatised phenomena. As the study of this area is developing there is now a need for critical and theoretically informed debate regarding conceptualisation, significance and roles. This edited collection explores the core themes of consumption, media technologies, representation, identities and culture to offer new insight into how sports events contribute to generation of individual and shared meaning over personal, community and national identities as well as the associated issues of conflict, resistance and power. Chapters promote a critical (re)evaluation of emerging empirical research from a diverse range of sports events and locations from the international to local level. A multi-disciplinary approach is taken with contributions from areas including sports studies, media studies, sociology, cultural studies, communications, politics, tourism and gender studies. Written by leading academics in the area, this thorough exploration of the contested relationship between sports events, society and culture will be of interest to students, academics and researchers in Events, Sport, Tourism and Sociology. Katherine Dashper (PhD) is a Senior Lecturer at Leeds Metropolitan University. Her research interests include gender and sexuality within sport and leisure practices, with a particular focus on equestrianism and rural recreation. She is editor of Rural tourism: An international perspective (Cambridge Scholars Press, 2015). Thomas Fletcher (PhD) is Senior Lecturer at Leeds Metropolitan University. His research interests include: ‘race’/ethnicity, social identities, families and pets, and equity and diversity in sport and leisure. He is editor (with Katherine Dashper) of Diversity, equity and inclusion in sport and leisure (Routledge, 2014). Nicola McCullough is Senior Lecturer at Leeds Metropolitan University. She is Course Leader for the MSc in Sports Events Management.. Her research interests are broadly concerned with governance and major sporting events and the importance of professionalism within the global sports events industry.